December 17, 2013 Posted in Uncategorized. You may of noticed by now I sometimes talk about food very fondly indeed. I would go so far to say that I tend to eat my way around countries and really discover a hell of a lot via the medium of food. Most of the videos on my blog feature food of some sort or another and that is mostly because I love eating. Nagano prefecture has had a lot of things to try, more so than normal I feel. Let’s deal with the elephant (or in this case horse) in the room first. Yes the Japanese eat horse. I have not come across this until now but as you probably know am not usually scared of trying something new at least once so meet Basashi. 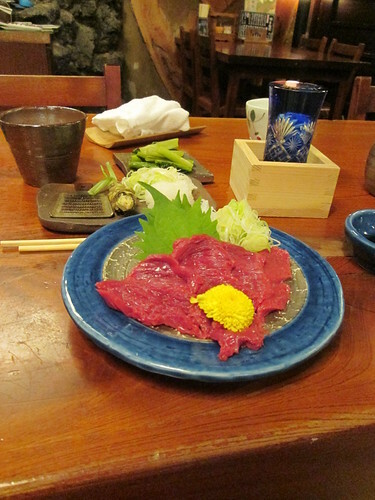 Basashi is actually raw horse meat which may to you sound horrid but you really have to open your mind when travelling which I may of said before. This is melt in your mouth stuff, it does not have a strong flavour as far as I can recall but I did remember it being buttery and delicious. Trust me if you are in this area, you eat meat and you do not try Basashi you really are missing out. Of course this is best eaten with another sought after food item from this area Soba noodles. Soba is something I am deeply passionate about, they are super simple and prepared with just a dipping sauce mostly. The idea is that you dip your cold Soba noodles into a soya based sauce and then slurp with gusto. The slurping draws in the flavour past the relevant cavities that increase the taste and by doing so you are complimenting the chef on his hard work. Soba are also usually served with Soba Yu (そばゆ), a hot water drink made from the water that the soba are boiled in in which you and add a bit of your sauce to add flavour. The Soba Yu is apparently full of fibre and nutrients which is contained within the buckwheat noodles. Of course the other great thing about buckwheat noodles are that they are gluten free so celiac’s can go mad on them but beware not all soba are made from buckwheat but traditionally they are. If that was not enough then you also need to check out something called Oyaki (おやき) a small dumpling that is filled with something yummy like pumpkin, apple, mushrooms or a green vegetable called Nozawana (のざわな). Of course the Vlog which I have attached to this would not be a Vlog unless I was stuffing my face at some point or another, so check that out for a visual reference to Oyaki. 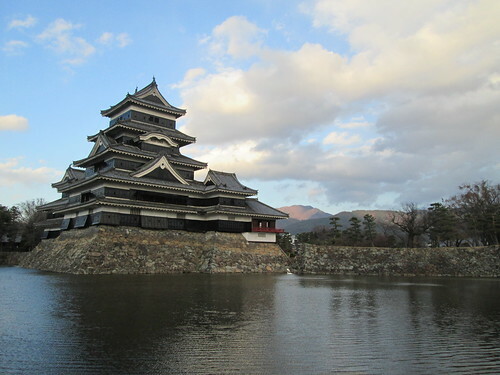 There is lots more to Nagano prefecture than just food of course. There is the beautiful and peaceful Zenkoji temple and they have what I think is the most beautiful castle I have seen in Japan so far. Matsumoto is about an hour’s train ride away from Nagano. It’s well worth taking a trip out there to go and see it for yourself. Still not enough? About an hour from Nagano there is Togakushi that has five beautiful shrines to visit and a Ninja house full of trap doors and such like! Sadly this was closed when I went so if I ever come back to Nagano this for me is a must. 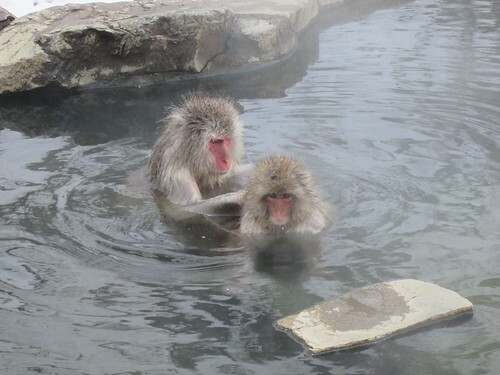 If that does not tickle your fancy buy a Kaedeno Yu ticket (¥1,500) which will pay for a local train up to Yudanaka from there catch the local bus (¥280) up to Jigakudani Yaen-Koen (also known as Monkey Park ¥500) and take photos of Macaque monkeys chilling out (or warming up) at their own personal onsen. When your done with that walk back to the station, find the huge statue of the Goddess of Mercy for World Peace then using the ticket you can jump into the onsen behind the station before getting back on the train to Nagano. So yes lots to eat and do in the area, have not even mentioned the fact that it’s easy to get up into the mountains and go skiing which is probably where the next entry will be from. I will leave you for now with some video. Next: Next post: Merry effing Christmas!